An original letter of correspondence between Joshua Coffin Chase and S. M. Crowell, a laborer at Isleworth Grove. Topics discussed in the letter include former Ocoee grower W. H. Reams' campaign for Orange County Commissioner of District 3 and Chase's request for Crowell and others to support Reams. 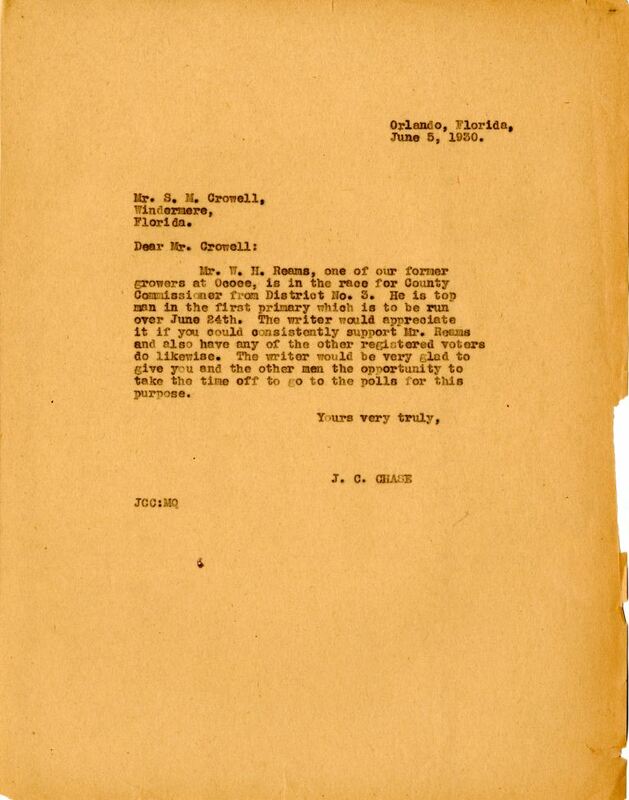 Original letter from Joshua Coffin Chase to S. M. Crowell, June 5, 1930: box 49, folder 20.84, Chase Collection (MS 14), Special and Area Studies Collections, George A. Smathers Libraries, University of Florida, Gainesville, Florida. Digital reproduction of original letter from Joshua Coffin Chase to S. M. Crowell, June 5, 1930. Mr. W. H. Reams, one of our former growers at Ocoee, is in the race for County Commissioner from District No. 3. He is top man in the first primary which is to be run over June 24th. The writer would appreciate it if you could consistently support Mr. Reams and also have any of the other registered voters do likewise. The writer would be very glad to give you and the other men the opportunity to take the time off to go to the polls for this purpose. Chase, Joshua Coffin. 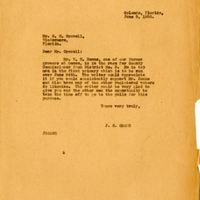 “Letter from Joshua Coffin Chase to S. M. Crowell (June 5, 1930).” RICHES of Central Florida accessed April 25, 2019, https://richesmi.cah.ucf.edu/omeka/items/show/2758.